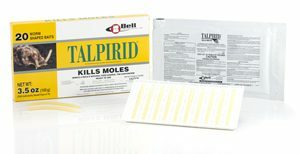 Talpirid Mole Killer is a worm-shaped mole bait scientifically proven in laboratory settings and field trials to kill moles. Moles usually die in their tunnels, often within 12 to 24 hours of ingesting the Talpirid bait, the company says. Developed and tested on live, captured moles, Talpirid works where grain baits and a myriad of home remedies have failed, according to the company. The bait mimics the mole’s natural food: the earthworm. Plus, it contains special enhancers that attract moles. According to the company, Bell’s mole bait is the first and only mole bait registered with the U.S. Environmental Protection Agency (EPA) using proven laboratory results.